Payroll management is a critical task that needs to be precisely executed to prevent your organization from shelling out more payroll taxes. This mandatory employer contribution is levied by the government to fund its various employee oriented activities like pension, healthcare support, disability compensation etc. Payroll tax rates are calculated by factoring in net salaries, perks and any other monetary entitlements paid by your organization to its employees. How to Calculate Payroll Tax Rate? 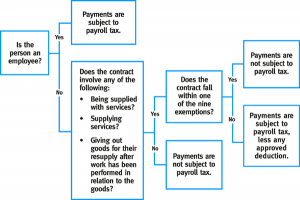 To calculate this, you need to factor in current payroll tax rates based on 5 decisive elements as discussed below. You have to deduct 12% of individual employee’s salary for contributing to Indian social security scheme (PF and Pension schemes). EPF (Employee Provident Fund) Act requires your organization to pay an equivalent 12% rate (as deducted from employee’s salary) to each employee’s PF account. 8.33% of the same would be diverted towards pension scheme provided the employee’s salary exceeds INR 15,000 per month. Another factor that contributes towards employer payroll tax rates is the contribution towards ESI (Employee State Insurance) scheme. 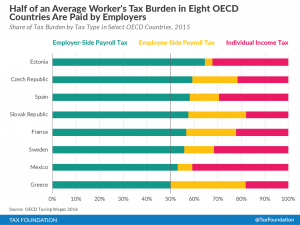 A tax rate of 4.75% of the wage payable to the individual employee is collected by ESI Corporation to provide health-related benefits to employees. For employees who are new on your organization’s rolls, you need to pay 3% per wage period for initial 2 years. If you are operating a business that has been classified under ‘occupational hazard’ related engagement of workers, you need to factor in a tax as per Section 10 of Indian Factory Act 1948. This tax is payable to the respective State Government for the appointment of a team of qualified medical practitioners for examining and certifying those workmen who are exposed to hazards that can endanger their health or life. State payroll tax rates on this account vary from state to state. The National Pension Scheme was launched by Indian government a few years back to facilitate linking of the pension fund with equity market for ensuring higher returns to employees. A minimum of INR 50,000 per annum is payable by the employee to avail of this stellar scheme. Your organization can undertake to bear the NPS contributions of the employees as part of its retiral plan extended to eligible workers. Payroll tax rates 2018 as per the income tax slab adopted by Union Budget on 1st February 2018 would be applicable. As an employer, you have to withhold the all relevant taxes payable by an employee on account of wages receivable, bonuses enjoyed and perks availed of. State taxes, as applicable, also need to be deducted from overall payment for calculation of payroll expenses. The net payment received by your employees would be gross payment minus the taxes withheld. At the end of the year, you have to furnish Form 16A to each employee to give an idea of the taxes withheld. 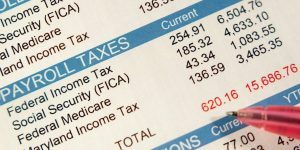 Why Aren’t Payroll Taxes Deductible from Income When Figuring Taxable Income? Now that you have a fair idea of the factors that contribute towards payroll tax rates, you may be wondering why these taxes are not deducted from organizational income while figuring the taxable income. This is because the taxes are deposited on a monthly basis or in accordance with employee wage period in the funds of respective federal units that are responsible for overseeing particular areas. The provident fund, for example, is payable on the monthly basis to EPF account and the social security taxes in ESIC funds. Since these are mandatory contributions which an organization is legally bound to pay for employees’ benefit, these taxes don’t attract the same amount of GST (Goods and Services Tax) and income tax as applicable on other transactions. Equipped with aforesaid information, you can now better strategize on ways to streamline the process of payroll management. An outsourced partner can definitely ease your organizational burden with proven and functional HR tools.